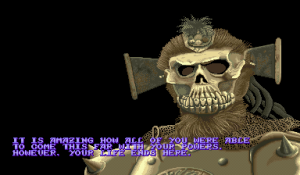 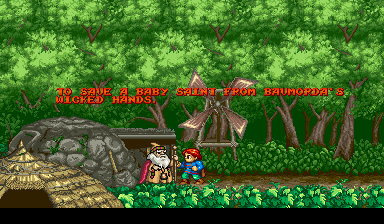 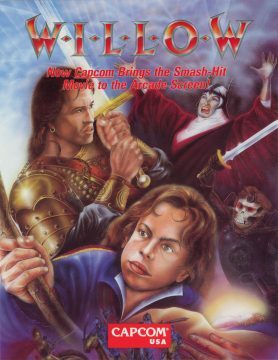 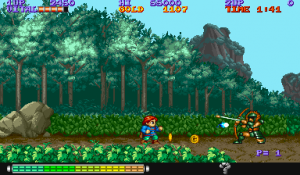 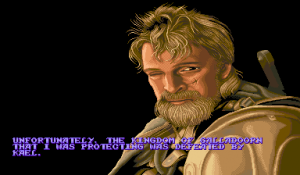 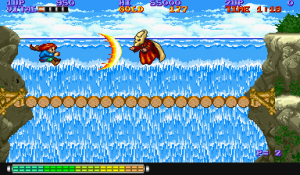 A year after the film, Capcom released two Willow games. 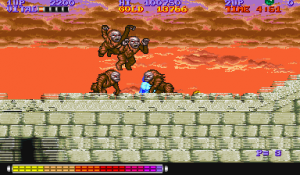 The first was on their CPS1 arcade board. 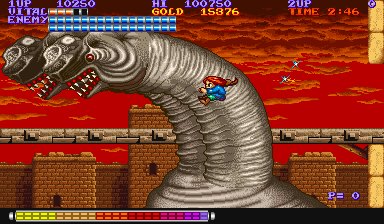 This sidescroller is like a mishmash of every oldschool Capcom action game you’ve ever played. 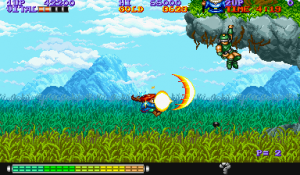 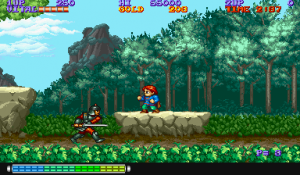 It has the look and feel of Ghosts ‘n Goblins, the overall structure of Strider, the sliding and charging of a Mega Man game, and the shop system from Forgotten Worlds. 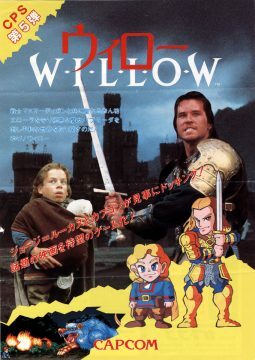 At the start of the game, you play as Willow. 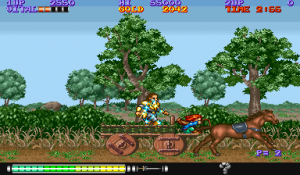 You travel through a lush, beautiful 2D environment, taking out Nockmaar soldiers. 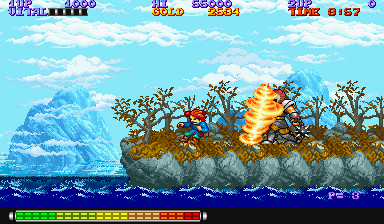 The game eventually throws some pretty hefty platforming segments at you, which Willow is quite adept at handling. 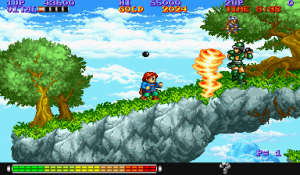 The jump control is superb, and Willow can also grab onto ledges above him and thus climb up to higher levels. To take down the Nockmaar soldiers, Willow uses magic. He can rapidly fire projectile bursts at enemies, but he can also charge energy and unleash more powerful spells. 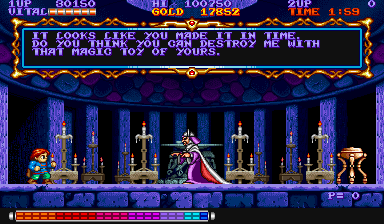 However, these spells must first be purchased. 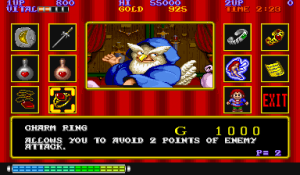 With each spell you purchase, the meter that indicates how much energy you’ve charged grows longer and shows a bigger spectrum of colors. 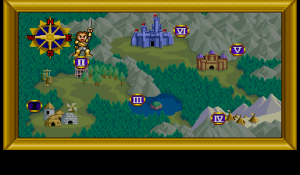 The colors indicate which spell you’ll execute once you let go of the attack button. 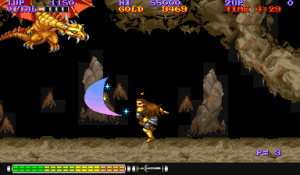 These spells range from more powerful projectiles to the ability to stop time and damage all enemies on screen. 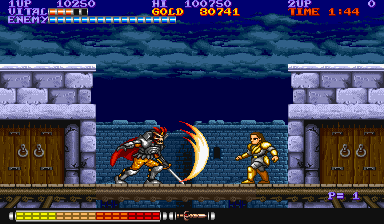 After the first stage, you will then take control of Madmartigan, who fights in a more rudimentary fashion using his sword. His sword, which looks eerily reminiscent of Strider’s Cypher blade, can also be charged like Willow’s magic. 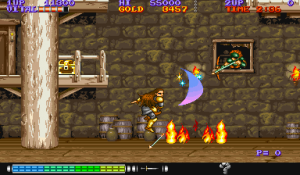 But charging the sword merely increases the range and potency your slash will have once you release the attack button. 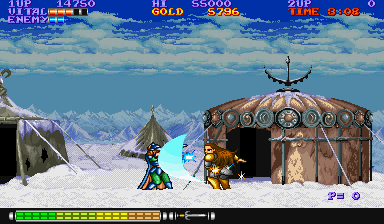 The shopkeeper sells swords alongside Willow’s magic spells, and each sword increases Madmartigan’s offense and his charging potential. That said, the two characters are fairly different. Sadly, you don’t get the choice to switch between them until the last two of the six stages. 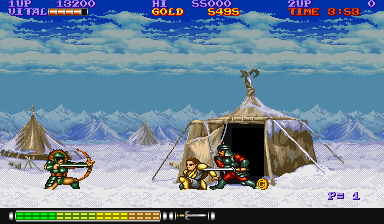 The best aspect of Willow the arcade game is how well it recreates the scenes from the movie. Unlike the NES counterpart, this game is very faithful to its source material. Scenes like the wagon chase and the battle in Tir Asleen are projected perfectly into this game, and they’re quite visually impressive considering this game’s age. 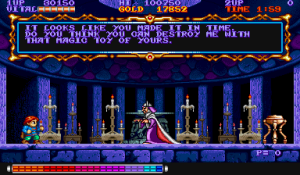 It’s a shining example of the CPS1’s power. The music, though catchy, is extremely out of place. 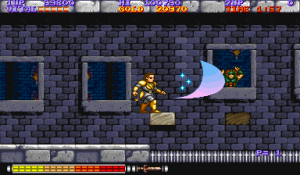 It’s all standard ’80s pop-ish stuff that sounds more like it belongs in a Mega Man game. The sound effects are pretty standard CPS1 fare, sounding about on par with a Sega Genesis, which means a lot of explosions that sound like violent flatulence. There are some good voice samples, though.